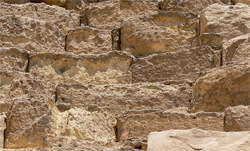 Professor Michel Barsoum, Distinguished Professor in the Department of Materials Science and Engineering at Drexel University, and colleagues have found scientific evidence that parts of the Great Pyramids of Giza were built using an early form of concrete, debunking an age old myth that they were built using only cut limestone blocks. The results of his study have been published in the December issue of The Journal of the American Ceramic Society (“Microstructural Evidence of Reconstituted Limestone Blocks in the Great Pyramids of Egypt,” by M. W. Barsoum, A. Ganguly, G. Hug). 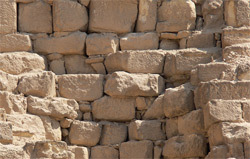 Although this discovery does not solve all of the construction mysteries of the pyramids, the impact of these findings has great potential for developing countries and for the construction industry. The basic raw materials used for constructing these “geopolymers,” as this early form of concrete has been dubbed, can be found virtually any where in the world. Replicating this method of construction would not only be cost effective and long lasting, but would also produce less carbon dioxide than the process used for creating Portland Cement, the current building material of choice. Professor Barsoum presented his findings at a news conference on November 30 at 5:30 P.M. at Le Palais de la decouverte in Paris, France. An article about this discovery appeared in the November 30, 2006 issue of the New York Times and was syndicated in the International Herald Tribune, Chicago Tribune, Houston Chronicle, Dallas Morning News, San Francisco Chronicle, Indianapolis Star, Arizona Republic (Phoenix), Hamilton Spectator (Ontario), DeseretNews.com, a USA Today blog, Kansas City Star, and Gainesville Sun (FL). Other articles were published in The Times (London), whose story was syndicated and published on TheAustralian.com, Rediff.com, Technocrat.net, and NowPublic.com; and Philadelphia Inquirer, whose article was also published in the Philadelphia Daily News and The Wichita Eagle (Kansas). Radio France International and WTIC-AM (Hartford and New Haven, CN) broadcast a story. Other stories were published by Nature.com, Minneapolis Star Tribune, Middle East Times, 7Sur7.be BitsOfNews.com, the Turkish Daily News, Azom.com, YubaNet.com, New Scientist, Daily Star (Egypt), Reforma (México), and The Discovery Channel online. A United Press International story was published by MonstersAndCritics.com, EarthTimes.org, and DailyIndia.com. TF1 (French cable television) and France2 (French public television) broadcast stories.